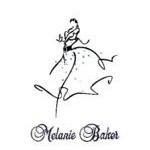 Melanie Baker Designs is based in London designs clothes for any occasion using fabrics from around the world. Please give us a call and take advantage of our bespoke services. Melanie Baker Designs provides a bespoke tailoring and dressmaking service specialising in women's clothing, evening wear, wedding dresses, mother-of-the-bride clothes, tailored suits etc. All made to order. Melanie Baker can create that perfect outfit for any occasion. As a bride of a certain age Melanie did such a fabulous job with my wedding dress - she was very patient and came up with great ideas with regard to colour, fabric and the design - basically everything! It was a really enjoyable experience and I was thrilled with the results - I could not recommend Melanie more highly . I met Melanie through a mutual friend at a time when I was considering how to ensure that I got the right dress for my daughters wedding. She was very patient with me and the many times I changed my mind about style material etc. 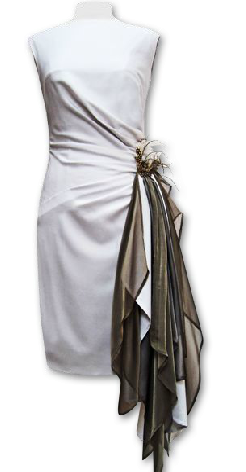 She helped me select the beautiful material for my dress and adapted it as our ideas "evolved". I have never had so many complements on a dress, and that is a testament to Melanies attention to detail and amazing workmanship! If you want a unique design beautifully made, I cannot recommend Melanie strongly enough. I was put in touch with Melanie by a friend when I was wondering what to wear for my daughter's wedding. It was the best possible recommendation. I had a clear idea of the colour of dress I wanted but was less sure about the design. With great patience and tact, she came up with the perfect dress which made me feel a million dollars and drew many compliments. She's a highly professional perfectionist and great fun too. I've already made an appointment to plan what I'll wear for my son's wedding, which is following hot on the heels of his sister's! All my worries of an outfit for our daughters wedding were taken away by Melanie !! Although we haven&rsquo;t had the wedding yet my outfit has been stressless and much admired by those that have seen it so far!!! All I can say evening. July 25this a Big thank you to Melanie !!! Melanie has made me the the most perfect dress to wear to my daughter's wedding. I had spent so many fruitless hours trawling around shops and websites looking in vain for something elegant and well-made, and then I found Melanie. I am so glad I did. She understood exactly what I wanted, and what would suit me. From my vague descriptions she sketched out the perfect dress, and then took me to a perfect Aladdin's Cave of a fabric shop, where she quickly found my dream-coloured fabric (silk and lace). Every fitting was a joy &ndash; Melanie is honestly one of the loveliest people I have ever met, and I feel I have made a friend. Her knowledge, talent and skill are enormous, and I would urge anyone looking for the perfect outfit to go straight to Melanie. I am already planning my next gorgeous dress from her! My outfit was made for a wedding in March and loved it so much have worn it already! I also received many compliments too. Thank you so much. We only gave ourselves 2 months to organise our wedding which, even in winter, turns out is not long enough for most wedding dress designers. I was at my wits end trying to find someone to make my dream dress for me. After numerous phone calls and trawling the internet I found Melanie. She was just the person I needed. She created the perfect dress, exactly what I had in mind. When I collected it I really felt it was so special because of the care and love Melanie herself had put into its creation. It made my wedding day perfect too. I have absolutely no hesitation in recommending Melanie. I feel honored that I found her and that she was part of my wedding story! 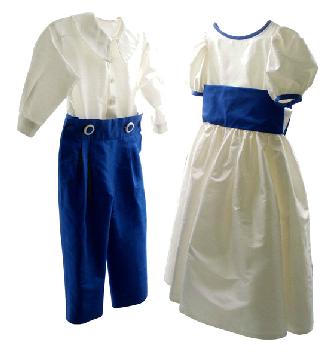 I needed a very special outfit for my son's military wedding and I spent ages researching online to find a suitable dressmaker. Looking through the photos on her website I could tell that Melanie was extremely talented and so my fun journey began. She understood my piffly ideas and transformed them into a stunning frock coat, dress and a matching bag. It was a fascinating process which I thoroughly enjoyed. I whole heartedly recommend her! Melanie designed and made my outfit for my son's wedding. I enjoyed every moment of it - from working on the design to chosing the material to getting the fit right. Melanie listened carefully to what I wanted and created something that was just right for me. Melanie is great fun too so the whole experience was a joy from start to finish! 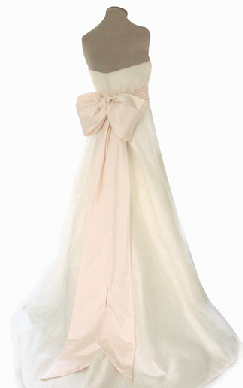 I bought my wedding dress from Melanie - we worked together to turn vague ideas I had into a beautiful, elegant design. Melanie advised me about fabrics that would work and when I found out I was in the early stages of pregnancy she made sure the dress would stay fitted and gorgeous for the big day! She was also sympathetic to my inability to stand up long for fittings! Melanie made buying my wedding dress a really fun experience and I absolutely loved the final piece - it was wonderful knowing I had something totally unique, fitted to me and which reflected my personal style to the nth degree. Melanie was absolutely brilliant and we were so pleased with the whole process, having never had dresses custom made before. Melanie designed and made us three individual and unique dresses, inspired by own own style, a tie for the groom and a gorgeous 1950s influenced dress for the bride. We had such fun suggesting designs, going for fittings and enjoying our dresses on the big day. A very talented dressmaker and highly recommended! One of the biggest worries I had about my youngest daughter's wedding was 'what shall I wear?' However, a visit to Melanie quickly dispelled all these concerns. 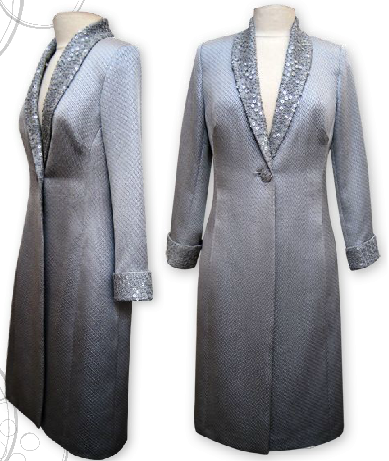 Melanie and I had a discussion about what would be suitable and she very quickly came up with a sketch of a proposed silk dress and light wool jacket to be piped in same material as the dress. I had an extremely enjoyable trip with Melanie to buy the material and three fittings later I took home the most wonderful and perfect outfit, including even a matching handbag which Melanie had made. Very much admired by everybody. Thank you Melanie - you made my day! Melanie was able to take my vision and replicate it to a tee ! I couldn't have been happier - beautiful work and such an easy process. Wish I could afford to have her make all my clothing!!!! I contacted Melanie after reading many of the fantastic reviews she'd received. With only 3 weeks until a good friend's wedding, she very kindly agreed to design a dress based on a photo I'd been carrying around for months. Melanie bought beautiful navy Thai silk fabric on my behalf and after 2 fittings I walked away with exactly the dress I'd wanted with plenty of time to spare. I love it and have received lots of compliments. Melanie was lovely to deal with and I absolutely recommend her work. Many thanks to her for my perfect dress. A friend recommended Melanie to me and I felt in extremely competent hands the minute I met her. I am delighted with my jacket, dress and skirt all of which are unique. I loved my appointments and was sorry when I had my final one, perhaps my younger son will be married soon! I had loved the 'mother of the bride' outfit Melanie had made for a friend of mine so when it came to my youngest son's wedding, I had no hesitation in getting in touch with her. The whole experience with Melanie could not have been better. From helping me to find the perfect material to the design and production of my outfit Melanie was both sympathetic to my likes and dislikes but also came up with brilliant ideas and suggestions making me feel completely at ease and confident that the end result would be a success. Nothing was too much trouble for her even when at the last minute a final alteration had to be made, it was done quickly and without any fuss. The final result was perfect and going by all the compliments I received on the day and every time I have worn it since I am not the only one who thinks so! Melanie made another outfit for me at the end of last year and again It was gorgeous. I have also passed her name on to several of my friends and they are all equally as pleased. I could not recommend Melanie more highly - she is amazing! Melanie made my wedding dress and four bridesmaid's dresses from scratch. We chose the materials together. She helped direct the design. She created the most beautiful dresses with great skill and care. The bridesmaids genuinely said they were the nicest bridesmaids dresses they had ever seen. I agree with them: they were elegant and beautiful. All my fittings with Melanie were an absolute pleasure. She was very flexible about timing. She worked tirelessly on my dress and made it so beautiful. 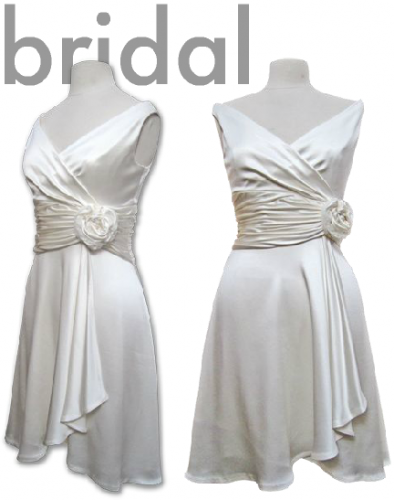 She really knows what she is doing and has a real eye to make the most flattering dress for any body shape. An absolute pleasure of an experience and great value. Melanie recently made a bridesmaid's dress for me which was a gorgeous design and beautifully made. Having just had a baby my figure was changing a lot but it fit me brilliantly and was flattering, too. Thank you Melanie for a lovely dress and a lovely experience! Melanie is brilliant - and so nice. Melanie is wonderful. She helped me (as fussy perfectionist) to choose the right fabric and was then so patient with the design of 3 dress and jacket outfits in 2015. All fitted like a glove and were hugely admired. Do not hesitate to call her for something special at a sensible price. I was introduced to Melanie by a mutual friend to discuss having an outfit made for the wedding of my son in Jersey. From the outset Melanie was 'in tune' with what I thought I would like. The result was pure perfection - and judging by the comments on the day, she managed to make me feel very special. Melanie has wonderful ideas, an eye for detail and colour and would not hesitate in recommending her to other friends. Thank goodness I found her. All the lumps and bumps covered! I was reluctant to go down the 'made-to-measure' route for my son's wedding as I had seen some pretty awful examples. I was persuaded to meet Melanie who held my hand all the way from choosing the fabric to the final fitting. She is delightful company and a real confidence booster. If you use Melanie for that 'important outfit' she will not let you down. I was recommended to Melanie by a friend. From the moment I crossed her threshold I knew I had made the right decision to have an outfit made for my daughter's wedding. After talking through my ideas Melanie drew some sketches which were exactly what I wanted. We then had fun shopping for the material. At every fitting her attention to detail was incredible. Melanie made me a beautiful dress and jacket. The compliments I received during and after the wedding were a real confidence boost that the day was as perfect as I felt in one her creations. Anyone who chooses Melanie to make their dream outfit will not be disappointed. A secret gem in South West London. I was struggling to find that 'special' dress for my daughters wedding when my daughter suggested I should have a dress made. At first I was apprehensive because I could not visualise exactly but I would like, but after my initial meeting with Melanie and a few sketches later I felt confident this was a great idea. From our meeting through to selecting material and to the final fitting, Melanie was welcoming, professional and enthusiastic. I was absolutely thrilled with my dress and handbag and on my daughters big day I received numerous compliments. I wore it will confidence and ease and would highly recommend Melanie and her craftsmanship. A friend recommended Melanie to me and I am so grateful that she did. I turned up hoping for a dress to wear at a wedding and an outfit for Ascot but without any preconceptions. We talked it over and Melanie came up with lots of ideas, and as a result has designed the most beautiful suit with a jacket that goes with a stunning dress. Right from the start we had a fun morning choosing material, and a happy time during the fittings adjusting and tweaking as we went along. I told her that my figure fluctuates and she took this into account, tailoring my clothes to fit, flatter and feel comfortable. Melanie really listens to you and it was a joy to work with her. Melanie designed and made the most perfect dress for me to wear at my son&rsquo;s wedding together with a matching handbag. I received countless admiring comments from so many people that I felt truly confident that I looked my very best on the day. I have subsequently worn her dress to another very smart event with the same effect. I would highly recommend Melanie&rsquo;s designs and skill to anyone and I have always admired her work. She is exceptionally talented, her advice is excellent and she is great fun to visit. 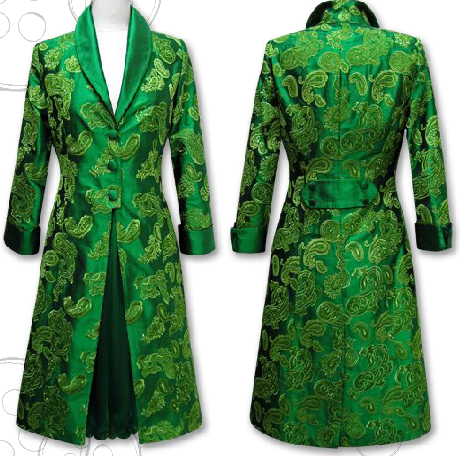 A friend recommended Melanie when I was in need of evening clothes for Livery Company events. I had no definite ideas and was open to suggestions. 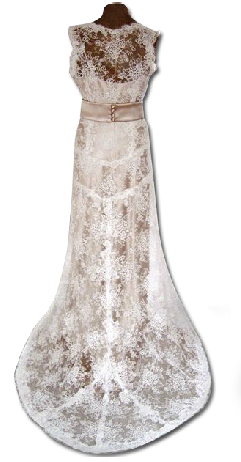 Melanie's inspirational sketches and selection of fabrics led to a beautiful dress which received many compliments. I was so pleased that, over the next year or so I returned to her for several other outfits including two more evening dresses - all very different. The whole experience was delightful - I cannot recommend her too highly. As Mother of the Bride I felt under pressure to look 'special'. Melanie recognised this, took me under her wing and guided me through my first 'bespoke' experience. She listened to what I wanted and drew up some sketches with ideas. Together we went shopping and she helped me make decisions on pattern and colour and fabric. Her experience and understanding of what I was trying to achieve with my outfit was wonderful. She created a beautifully designed, elegant summer coat and dress which fitted me perfectly. I felt like a million dollars on the day and have never had so many compliments. Thank you Melanie you helped me and gave me confidence and I can't thank you enough. I would recommend her without hesitation. 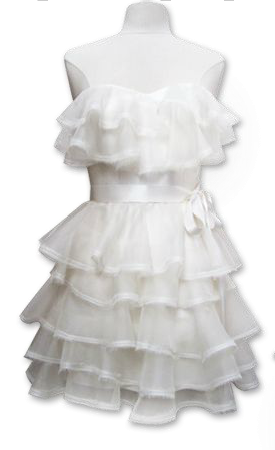 I was recommended to use Melanie to make my dress for my son's wedding. I was not disappointed! From our first meeting right up until I picked the dress up, I found her to be totally professional, but at the same time very friendly and fun. She listened carefully to my requirements and designed my dress exactly as I wanted. She was also extremely helpful with advice on the fabrics. I felt a million dollars at the wedding and have only Melanie to thank for that. I can thoroughly recommend her to anyone! My dream wedding dress was created by Melanie Baker. She is a true artist with flare and inspiration and certainly gave me the confidence too feel womanly and beautiful in my design of dress but in her creation. I certainly would recommend Melanie to anyone who wishes to have a unique creation with an extremely professional and personal service. When I began my search for an outfit, to wear to my daughter&rsquo;s wedding, a friend suggested that I make an appointment to see Melanie. My friend had been to two weddings, where the mother of the bride had been dressed by Melanie, and she had been very impressed by both outfits. I took two of my favourite dresses with me, to my first meeting with Melanie, to give her an idea of the styles that I liked. Melanie drew some amazing sketches. The design was decided and we headed into London to buy fabric together. Three fittings later and I had my beautiful, unique dress, which fitted me perfectly. Melanie also recommended a milliner and helped in the choice of hat, which was stunning, too. Melanie is highly skilled, very professional and a pleasure to work with. The quality of the workmanship, in my outfit, is exquisite and I highly recommend her. One happy mother of the bride! From the word go, I felt instantly at ease with Melanie. After being welcomed into her home, she offered me a choice of materials and colours, and I showed her an outfit that I already owned to give her a bit of inspiration. The end result was perfect - it was well fitted, had good attention to detail and I felt she had really listened to what I wanted. I didn't need to change anything. I would recommend her to everyone! I have an existing dress that is my favourite and wished for an exact copy in a different material having picked up some silk in Burma and wishing for it to be matched with a contrasting colour silk. I found Melanie by searching Google for dressmakers local to me. Melanie has an amazing way of getting into your thoughts and bouncing idea's that can enhance your own idea's, or even proving superior. The whole process was so quick, I had need of only one fitting and enjoyed the banter and thoughts of Melanie, never once feeling that I was hurried or in the way despite her existing schedule and her exceptional eye for detail. Her dressmaking skills are beyond compare! Needless to say the resulting garment is very very high quality, and now my "new favourite". My recommendation cannot come too highly. I needed a special outfit for a special family wedding and after trawling through the ready mades became very disillusioned with the choice available, so I decided to get a unique outfit made. I found Melanie online and it was with some trepidation that I went to meet her, along with my sister, who also decided to get her outfit made. Melanie put us instantly at ease. I had definite ideas about what I wanted both in colour and style, but whilst sitting in her attic studio I saw a swatch of the most wonderful embroidered silk. I instantly fell in love with it and decided it would make a great jacket. Melanie got the fabric for me and matched it with a fantastic shot silk for the dress. She made drawings of my ideas for the dress and jacket and after three fittings, where she was very meticulous with tweaks and darts for that perfect fit &ndash; there was my wonderful outfit! It is beautifully made, so much better than anything I have ever bought and above all, I feel so good in it! I know it will be much admired at the wedding in a few weeks&rsquo; time. All the time Melanie was friendly, professional and skilled and spot on with her suggestions. I would thoroughly recommend her and can't wait to find the occasion for another outfit! I went to Melanie with a picture of a cocktail dress that I wanted replicated. After we found the perfect fabric, Melanie offered a few suggestions that she thought would make the dress more suitable. I agreed with every suggestion and the result was breathtaking. Melanies manner, professionalism and skills are exceptional. I cannot wait to have another dress made by Melanie and will certainly be recommending Melanie to everyone I know. For my upcoming wedding Melanie was commissioned to create a bespoke bridesmaid dress for my sister. Throughout the process Melanie was highly professional, taking time to advise us on our various design options and integrating our suggestions and feedback. 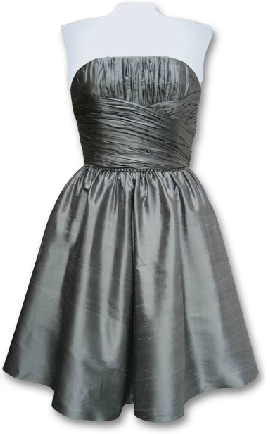 The final product was a stunning bridesmaid dress that we are absolutely delighted with. I would have no hesitation in recommending Melanie to others. I recently decided to do something I'd never thought of doing before: have a dress and jacket specially made. After trawling lots of websites, I settled on Melanie - but with some anxiety. What if, after all the discussions and work, I didn't like the end product? (The advantage of buying something ready-made is the security of knowing exactly what you're buying.) Melanie listened carefully to my likes and dislikes, made lots of suggestions, came with me to choose the materials, and happily gave me several fittings so that she could make various tweaks and changes. The result is that I now have an outfit I really like. So if, like me, you're a newcomer to personal tailoring, I'd strongly recommend Melanie. I needed a special outfit for our only daughter's wedding and Melanie was recommended by my sister-in-law(size 10). 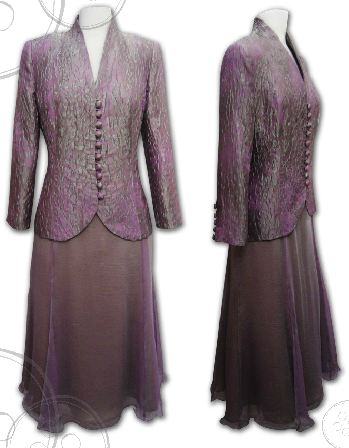 Being several sizes larger, it was with some trepidation that I rang Melanie to fix a meeting.She put me at ease at once, made several sketches while I told her how I envisaged what I wanted to wear and then presented me with the perfect design for a dress and coat. When I said I really didn't want to trail round looking for fabric, she opened her cupboard and out tumbled the most lovely material....job done! I had several fittings which were punctuated by much laughter and sound advice. From start to finish, Melanie was professional and meticulous about the finish of the outfit...she even made a change to the back of the coat at the final fitting which just added that extra something. I cannot recommend her highly enough....Oh yes, everyone, and I mean everyone, said what a fabulous concoction it was.And guess what? They were absolutely right! "After a quick engagement, and only 3 months to organise a beach style wedding on the other side of the world, I found Melanie's website, and spoke to her about making my wedding dress. From this moment, Melanie was fabulous. As she was throughout the whole process. I'm not terribly conventional (my wedding dress was short and my veil long), so I needed my dressmaker to be flexible, broad-minded, with flair and creativity, as well as offering up their own ideas with what may, or may not, suit me in the most honest, non-critical fashion. Melanie is ALL of this, and then some. She is brilliant, both as a person, and her skills as a dressmaker. Not to mention tireless, hard-working, enthusiastic and innovative. When time was of the essence, and wedding organisation can be so stressful, Melanie understood all of this, and I felt no stress regarding my dress. My wedding dress was perfect, I absolutely love it, and Melanie's skills are second to none. It was such a wonderful joy to work with Melanie and I cannot recommend her more highly. " Melanie made a dress and coat for my daughter's wedding in April. She went to endless trouble to ensure that she was designing exactly what I wanted, and helped me to find the perfect material. The result was an amazing outfit that flattered good points and minimised the bad. It not only looked wonderful but was very comfortable. I received many compliments, and my husband loved it too! I could't recommend her enough- it was such treat to have someone so helpful and professional make something so perfect for me. I found Melanie on the internet after an unsuccessful meeting with another local dressmaker. 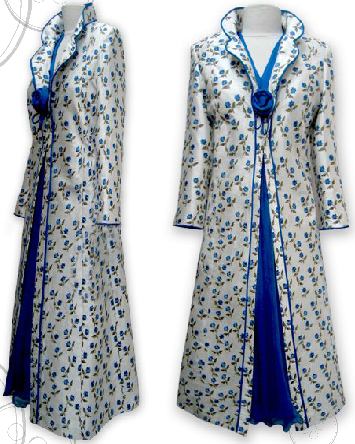 I wanted a dress making for my reaffirmation of wedding vows celebration, but didn't want anything too "weddingy". Melanie listened to my ideas for the design, shared her own and showed me fabric samples, then suggested where I went to look for material. She created the most beautiful dress which not only looked stunning, but felt fabulous to wear.So many people commented on the day on how lovely it was. She also came up with a matching bag which completed the outfit perfectly. Melanie was patient when I was indecisive, very attentive to what I thought I wanted, and made me feel very important. Our fittings were fun yet productive. Melanie is a true professional with a superb eye for detail. I would recommend anyone wanting that "special" dress to consult with her and not bother with "designer" shops who couln't begin to match her quality and standards.I cannot thank Melanie enough for my beautiful dress and hope to wear it again soon. My Mum has known Melanie for years and has always raved about her genius in making clothes for her... Well Melanie certainly lived up to Mum's description and MORE!! Melanie simply couldn't have created me a more stunning ball gown. The design, mock up, creation and her hours of hard work ended up producing something even better than I could have ever dreamed of. AS FOR the fun and laughter we had whilst my magical ball gown was in production was second to none. Our fittings were full of laughter and fun. I shall just have to be back to Melanie very soon to have some more fantastic fitting clothes made-if only for the hilarious time we have together, let alone her creative genius. I really couldn't recommend someone who is more brilliant in the art of creating clothes for women. Anything you want Melanie will make it, and better than your expectations. When I found Melanie through this review site I had been looking for a wedding dress with no joy for about 5 months!! I went to Melanie with a few ideas and from them Melanie was able to create me exactly what I wanted. 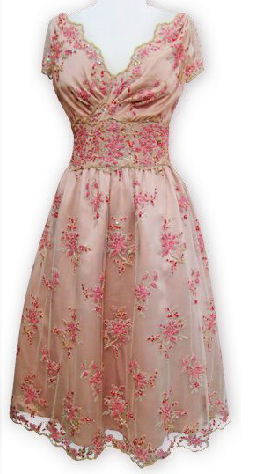 It is a beautiful dress, very unique and it fitted perfectly. There was no way I could have found this in a shop. Melanie was very patient with me when I kept changing my mind on little details and always gave great advice! Thankyou!!! I was in need of a dressmaker close to my area in Clapham to make my wedding dress and was so happy to have found Melanie. I had been quite worried about 'just finding someone off the internet' but found Melanie not only to be a lovely person but her work amazing. Her attention to detail and sewing is incredible. I absolutely love/d my wedding dress and would highly recommend Melanie to anyone. Thank you for your kindness and beautiful work Melanie. You have a wonderful talent! I can not recommend Melanie and her dressmaking services enough. I was having problems finding the perfect wedding dress for my wedding in Thailand and she was able to make me a stunning dress for my special day. Melanie is extremely talented and very professional, I wouldn't hesitate in recommending her! Thanks again Melanie, I will be sure to send you some pictures! I found Melanie on the internet & was absolutely delighted with the alternative dress she made for me for my wedding. 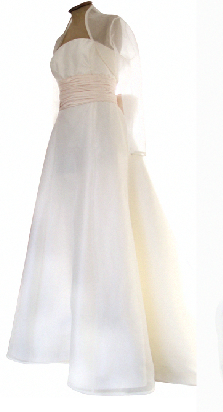 Melanie worked from a few pictures & ideas I had & created a wonderfully original wedding dress which was perfect! Lots of people commented on how lovely it was. Melanie worked extremely quickly as we only had about 6 weeks & managed the stress of my ever increasing bump effortlessly! I would recommend Melanie & will definitely use her again! Thanks so much! Meeting Melanie was a very positive experience. She is truely talented with a wonderful eye and great attention to detail. I was thrilled with the bridemaids dresses she made for me. They were of the highest quality - just like Melanie herself. Melanie did an outstanding job in creating a shrug to fit over the bodice of my wedding dress. Having consulted with Melanie over several weeks regarding the design of the shrug, I then very last minute ( 1 week before the wedding !) changed my mind on the design of the shrug. Melanie was not in the least bit phased by this and was incredibly accommodating in producing THE most beautiful garment despite the time constraints! I absolutely loved it, as did all the wedding guests!. I shall certainly be returning for further outfits in the future. Melanie did an amazing job in creating my dream dress and in the process she met the various requirements I had as well as adding in her own flare along the way. I will definately be returning for outfit 2! Melanie did an amazing job in creating my dream dress and in the process she managed to meet the various requirements I had as well as add in her own flare along the way. I have just used Melanie for the first time to make my wedding dress (a 50s style tea-length dress) and am thrilled with the results. I used her based on reviews of others on touch local. I started with quite a few ideas and pictures of dresses I liked around a 50s theme and we worked from there, taking into account what would suit me and the key elements I liked from other dresses. Melanie was patient with me e.g. my picky-ness on fit and dithers over fabric, worked with my ideas and we pulled some of her own ideas into the dress also. She also has great attention to detail and the dress and accessories were finished to a very high standard. My mum was also very impressed! I purchased a vintage dress for my wedding which required a slip and belt to be made. Melanie was able to design these perfectly to complement the dress and complete the vintage look. I felt completely confident from the word go and was given fantastic service. Melanie has designed and created most of my wardrobe for the last 15 years. For my work suits, Melanie creates smart, stylish outfits with a twist of fun. Her ball gowns and evening wear are heavenly and show off her true flair and creativity. Everything fits perfectly - after only one fitting. You never need to go shopping again! Melanie created the perfect wedding dress for me, I had some quite tough requirements due to the location of where I was getting married - on top of a moutain in deep snow! However the dress was fantastic and Melanie made it a great experience, with her attention to detail and great ideas. We are so pleased to have discovered Melanie. My daughter's wedding dress was perfect - Melanie listened carefully to what my daughter wanted and made really helpful suggestions. Her attention to detail and all round professionalism were remarkable. After many years finally found the perfect fit and design.The service was excellent and got en amasing suit that fit perfectly. Deffinetly will use Melanie again. 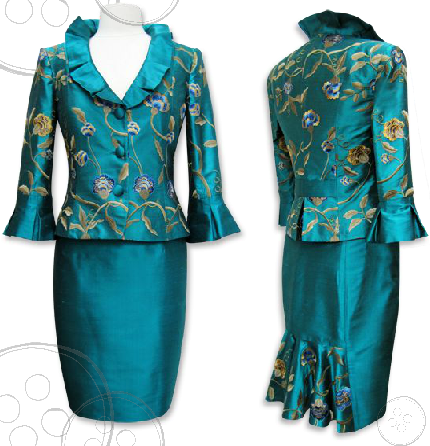 Melanie Baker has created a number of beautifully tailored jackets and gowns for me over the years. Everything she makes is individually designed and carefully fitted to the highest standard. She is a real delight to visit, and I am delighted to have the opportunity to praise her work in print.